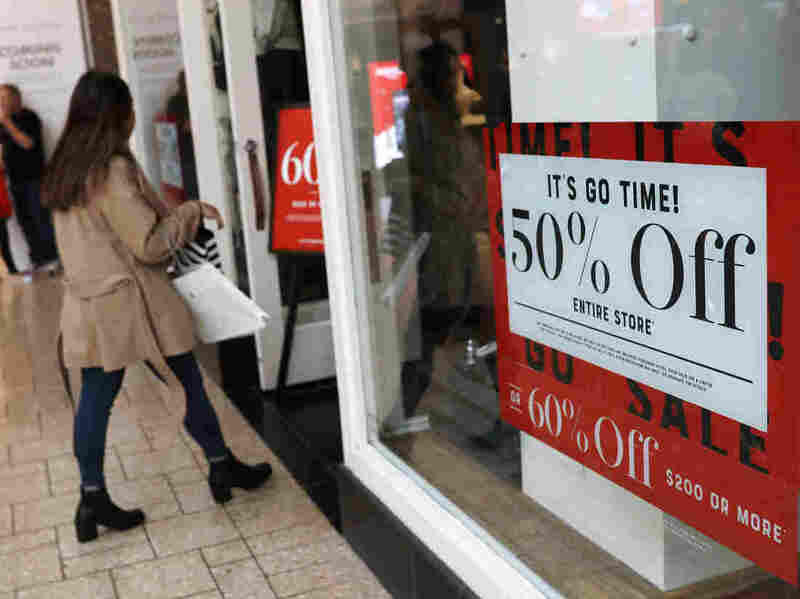 Shrinking Retail Spending May Cut Into Trump's GDP Target What started off as a strong holiday shopping season ended with a whimper, as December retail sales posted the sharpest drop in nine years. That could mean GDP growth will miss the president's target. The slowdown in consumer spending put a dent in overall economic growth. Forecasters at the Federal Reserve Bank of Atlanta lowered their estimate of fourth-quarter growth to just 1.5 percent. If that holds, growth for all of 2018 would fall short of the Trump administration's 3 percent target. "It appears that worries over the trade war and turmoil in the stock markets impacted consumer behavior more than we expected," National Retail Federation President Matthew Shay said in a statement. "It's very disappointing that clearly avoidable actions by the government influenced consumer confidence and unnecessarily depressed December retail sales." "The combination of financial market volatility, the government shutdown and trade tensions created a trifecta of anxiety and uncertainty impacting spending," said National Retail Federation chief economist Jack Kleinhenz. "This is an incomplete story," Kleinhenz said. "We will be in a better position to judge the reliability of the results when the government revises its 2018 data in the coming months." "The overall economy is very strong," he told Fox News. "Investment is strong. Consumption is strong despite this number, which has so many glitches in it." While Kudlow maintained an outward show of confidence, he also said he's pleased that the Federal Reserve has stopped raising interest rates for the time being. The sharp drop in December's retail sales is likely to reinforce the Fed's more cautious approach. While the White House argues faster growth can be sustained, many observers believe the effects are a temporary "sugar high" that will soon wear off. Growth in the third quarter slowed to 3.4 percent. A preliminary estimate of fourth-quarter growth will be released on Feb. 28.